Arcam rDock-uni with built-in DAC handles all iPhones and iPads | What Hi-Fi? Wireless streaming may be all the rage right now, but there are still those who might prefer a wired dock connection between their iPhone or iPad and audio system. 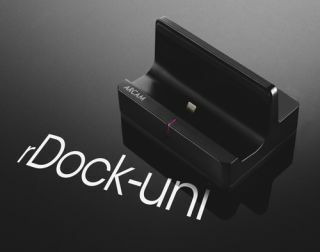 Arcam's new rDock-uni is designed to work with latest-generation iDevices fitted with a Lighning connector, and also has a rear-mounted USB socket for connecting older 30-pin Apple devices. It's avalable now and costs £200. There's a built-in Burr-Brown TI PCM1502 DAC (digital-to-analogue converter), which Arcam says "will allow music lovers to listen at a quality level that no other dock can achieve". And if that's still not good enough for you, there's a digital output to send the audio signal to an even higher grade external DAC such as Arcam's £400 irDAC or £2200 FMJ D33. The aluminium base of the rDock-uni provides a stable base for docked iPhones/iPads/iPods and will charge the portable device while it's playing. On the back of the unit are stereo analogue RCA outputs, a coaxial digital out and USB socket. A small remote is included as standard, which controls the docked device. System integration means the rDock-uni can also be controlled via the remote that comes with Arcam's Solo neo and Solo mini music systems, as well as most Arcam AV amps and the T32 DAB tuner. You'll be able to see the Arcam rDock-uni at this weekend's Bristol Sound & Vision Show.